Eco-friendly Chatham-created synthetic color #100 pink sapphires are real sapphires with the same chemical, physical and optical properties as their natural counterparts. Gem quality means there are no inclusions visible to the naked eye. She’ll turn heads with this eye-catching 18k white gold engagement ring with 66 G-H color SI1-SI2 clarity natural diamond accents weighing 0.64 cttw. Best of all, the center stone is a stunning 7.5mm round gem quality Chatham lab grown color #100 pink sapphire. The shank graduates from 2.5mm to 3mm wide. The halo is 4mm high and 12mm in diameter. You won’t find a better bargain anywhere. 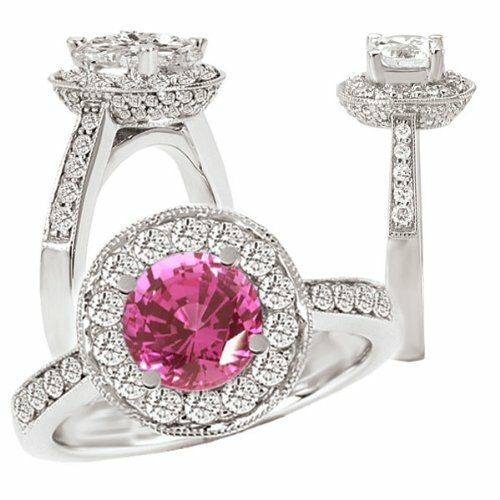 This entry was posted in Diamond rings, Engagement rings and tagged chatham, clarity, cttw, diamond accents, diamond halo, gem quality, gold engagement ring, jewelry, naked eye, natural counterparts, natural diamond, pink sapphire engagement ring, pink sapphires, white gold on April 8, 2011 by admin.